The queer Iranian-American songwriter reflects on love & longing with his solo debut, Half-Light. Rostam Batmanglij was barely out of college when his band Vampire Weekend became indie-rock superstars. Their 2008 self-titled debut album, which Batmanglij produced in makeshift studios he assembled in his and his friends’ apartments, not only put them on the map—it signaled the arrival of a musical wunderkind who would later lend his wistful melodies and sophisticated instrumentation to tracks by artists like Solange, Frank Ocean, and Haim. Having left the group last year, Batmanglij is now embarking on his own journey, releasing his first solo record under the name Rostam. An adventurous collection of buoyant, worldly pop songs, Half-Light (out September 8) finds the queer Iranian-American songwriter reflecting on love, longing, and double lives. Batmanglij recently spoke with his queer brother, Zal, the director and co-creator of the Netflix fantasy series The OA, for which Rostam composed the theme song. Zal Batmanglij: What’s your earliest memory of music? 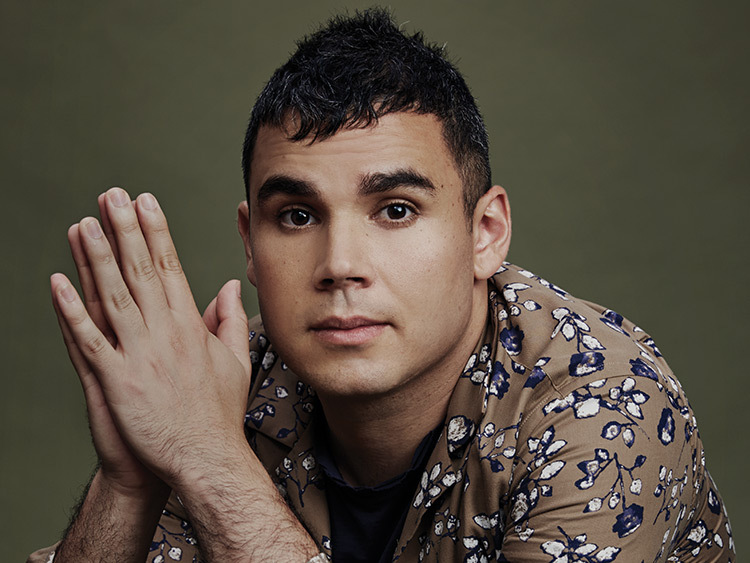 Rostam Batmanglij: I definitely remember wanting to hear the Beatles song “Taxman” over and over—needing to hear it. I also remember watching Tiny Toon Adventures and Animaniacs as a kid and they’d play classical pieces and I’d wait until the end to see if they listed the piece and try to find it. ZB: So you’d focus on the credits to find out what the pieces were, and then ask Dad to buy you those CDs? ZB: Wow, we grew up in a small townhouse, and I did not know that about you. But I feel like a lot of your relationship to music was very private. ZB: You produced all three Vampire Weekend albums and have collaborated with a lot of people—Charli XCX, Carly Rae Jepsen, Frank Ocean. So what does being a music producer mean? RB: In some ways it means having a vision for a song, or a shared vision for the song with the artist, and helping them realize it. I’ll do all kinds of different things to get there—plugging in a guitar and putting completely different chords under an existing song, or composing a drumbeat that becomes the song. One of the things I love about being a producer is trying to get more from singers’ voices than they maybe thought was possible. I love Haim’s ability to sing in harmony, so on “Walking Away,” one of the songs I produced on their new record [Something to Tell You], I really tried to push that to the fore. There are about 50 to 100 vocal tracks in that song, and it’s all the sisters singing different, interlocking parts, and at the same time there’s this emotional power to each of their voices. ZB: I was driving at maybe two in the morning two days ago through these windy L.A. streets with the windows down, and “Gwan,” a track from your new album, Half-Light, came on, and it was perfectly matched to the drive and the mood I was in. Does mood mean something to you? RB: Yes. And there are a bunch of different ways to access mood—the reverb you use, the kind of chords. Studying music you discover the hundred gradations between a happy chord and a sad chord. I’m always processing those possibilities. If we go to this chord, what will the feeling be? How does that interact with the lyrics? Can I ask the artist to change that word? ZB: When I was driving I wasn’t thinking, That’s my brother. I didn’t feel a personal connection. I felt a connection to the words and the longing—this otherness that’s on other tracks on your album. I connect to that otherness. RB: That’s a big part of the record, but it’s hard to talk about in some ways. I want people to come to it on their own. ZB: What’s the role of music in today’s political climate? RB: With a lot of songs on this album, specifically “Bike Dream,” I wanted the lyrics to act as a sort of Trojan horse, where if you wanted to interpret the song from a queer perspective you could. There’s a lyric in the chorus, “Two boys: one to love you sweetly, one does so discreetly.” What I loved when I wrote that was that it felt like you could interpret it as actually being about one person who’s being asked to be two different people. I think that’s something we as queer people, Middle Eastern people, and children of immigrants in America have experienced a lot. We’re seeing those kind of politics play out... But I can’t help but be optimistic. ZB: Yes. One of my favorite songs on the album is “When.” There’s something really hopeful about it. RB: I look back at my 20s, when I was figuring out what kind of person I wanted to be and overcoming obstacles I don’t think I was even aware of. There’s a recurring theme on the album of waking up, sometimes with somebody and sometimes on your own. The word half-light refers to both dusk and dawn, and some of the lyrics connect to that moment when the sun is coming in through the window, or that feeling when the day is ending and you have to take stock of what happened and think about the next day. ZB: Who are your musical heroes? RB: Brian Eno is an important one for me. There’s a quality of searching in a lot of his music, but he’s not searching for something that isn’t available to anyone, or to everyone. There’s an openness to his music I identify with—I want to make music everyone can arrive at. the theme for The OA. RB: The call came in for a violin piece, and I immediately thought, I want to write a melody with some drama built into it. I think the way I got there was by having these big melodic leaps. You know, the melody jumps up a fifth and then a sixth, and then it goes down. It’s not really climbing upwards—it’s leaping. ZB: At the screening at the Vista Theatre in Silver Lake, when the opening credits came up in the show 57 minutes in, and the OA is starting her story, and the camera pans over Russia, and your piece starts... I mean, there was spontaneous applause. I thought, That’s Rostam. RB: It was a fun piece. I think I knew I’d done a good job when I visited you on set and one of the crew guys was whistling the theme.